Gina Joseph is the Digital Engagement Manager for Cision, a PR Software Marketing Solutions company. Gina focuses on content creation, email marketing and engaging with clients. 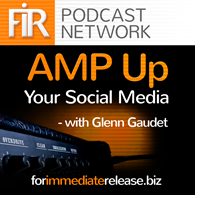 Gina recently joined AMP Up Your Social Media’s host Glenn Gaudet to discuss the importance of content in social media marketing. Meet regularly with your marketing and sales teams to have brainstorm sessions to decide on relevant content. Review questions and trends from your customers to create valuable content pieces. Create evergreen content (Q&As, Tip Sheets, etc.) that you can repurpose and repost. After you have your content, decide what the best avenues for sharing them are. Facebook? Twitter? Pinterest? Email? Who are you trying to reach and what would be most impactful? Rather than just reposting content from last season, refresh it with up-to-date trends or new tips and tricks. Gina has a background rooted in the media and communications fields, including writing, marketing and public relations. In the past three years she has developed her skills in social media, and now uses social media platforms to engage with media professionals and to promote Cision. She uses social media tools to monitor customer inquiries, appreciation, complaints, and sales leads. She is constantly learning about new platforms and ways to connect digitally. The FIR Podcast Network is brought to you with Lawrence Ragan Communications, serving communicators worldwide for 35 years. Information: http://www.ragan.com.